ANNAPOLIS, Md. (WMAR) — Delegate Joseline Pena-Melnyk thought she would be spending the last day of session next to her friend and colleague. "We call him 'Iron Mike' for a reason. He’s just such a strong man physically, emotionally, very well-rounded, and we thought we would see him tomorrow. Honest to God, we thought we would see him tomorrow," said Pena-Melnyk. People across the state are mourning the loss of a friend, a coach and a colleague – House Speaker Michael Busch. 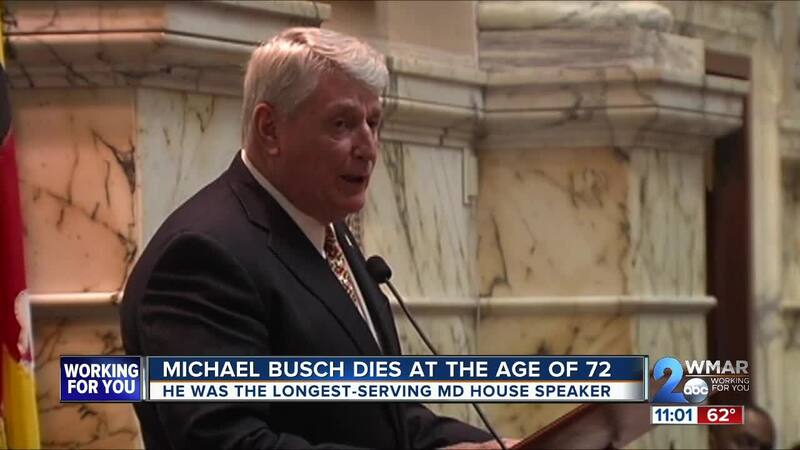 The longest serving House Speaker in state history, Busch died on Sunday at the age of 72, just one day before the end of the 2019 legislative session. Congressman Dutch Ruppersberger will remember Busch as a team player. "He loved to talk about pulling people together, teamwork, and I think he was good at it because he was good at sports and that was his philosophy, good teamwork," said Ruppersberger. "We saw him not just as a coach but as someone that was a teacher. He was even handed. He was just honest, had integrity. Everything that you want in a public servant", said Pena-Melnyk. 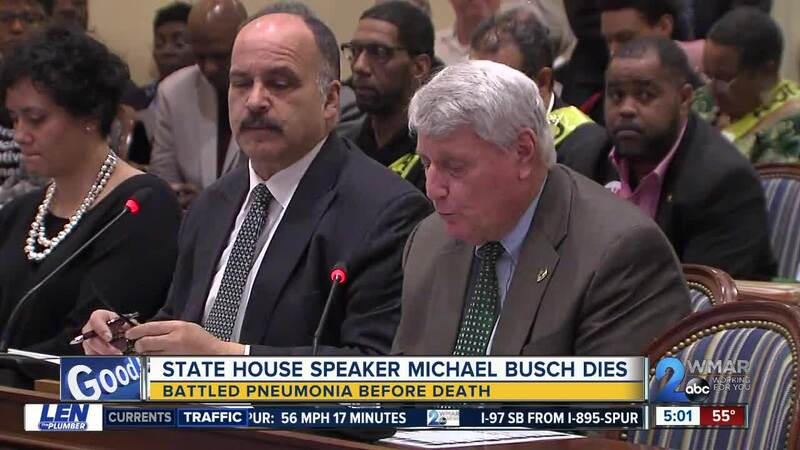 Several other local groups, lawmakers, and leaders are remembering Maryland House Speaker, Michael Busch. This is a profoundly sad day for Maryland. Mike Busch was a giant in our government—the longest serving Speaker in our state’s history. He cared deeply about improving the lives of Marylanders, and his legacy is evident in his many legislative achievements. SpeakerBusch and I came from different sides of the aisle, but we often came together in the best interests of the people of Maryland. He served with the decency and good nature of a teacher, a coach, and a family man. I was honored to know him and to work closely with him. On behalf of all Marylanders, the First Lady and I extend our heartfelt condolences to the Speaker’s wife, Cindy, their daughters, Erin and Megan, and all of his colleagues. He was raised in Annapolis, he represented Annapolis, and he will forever be remembered here. Effective immediately, Maryland flags will fly at half-staff in honor of Speaker Busch’s distinguished life and legacy until sunset on the day of interment. My heart is broken for Mike Busch’s family, the State of Maryland, and the Speaker's extended family - elected officials and staff that he has been a mentor and coach to over his time in public service. Mike has been a friend for years, and has led the state to new heights of environmentalism and education, while ensuring that a new generation of leaders move our state forward. He was a true model of a State Delegate; he cared for every corner of the state, but never forgot about the people he was elected to represent. I will miss him as a friend and partner in state government and I join all the state in mourning his passing. Maryland has lost one of her greatest champions today. And I have lost a dear friend and former colleague. Mike Busch was a titan of unstinting character who served the state he grew up in and did his job for Marylanders with passion, integrity, determination, and exuberance. As the longest serving Speaker of the Maryland House of Delegates, Mike’s good works can be seen and felt all around us. Under his leadership, we have become a more inclusive and just community with greater opportunity for all. When I served in the Maryland House of Delegates with Mike, many of us would fondly call him “coach.” Not just because his office was packed with photos of him coaching various youth sports teams and his history as a football star, but because he always had a way of bringing out the best in everyone who had the privilege of learning from him. We were all part of Team Maryland. As a lifelong Marylander, Mike dedicated himself to our state for over 32 years. Even when his health was declining, he was known to walk the halls of the State House whistling and singing. That’s just the type of person he was: full of life even during the most difficult times. Mike always stood with Maryland. And today, we stand with his family and all of those mourning during this heart-wrenching time. Our prayers and gratitude go out to his wife Cindy, and his daughters during this difficult hour. Marylanders are grieving the loss of one of their own today. Mike Busch was a force in Annapolis and he left a progressive imprint on the state that without hyperbole will last for generations. For me, and for Myrna, the loss is intensely personal. We have lost a dear friend and our hearts are broken while we mourn with his wife, his family, and his dedicated staff at the State Capitol. While we never served together in the House of Delegates, as a former Speaker, I watched Mike Busch’s ascent in Annapolis and saw throughout his career a public servant who put the people he served, his community and his family at the forefront of all he did. May his memory be a blessing to his family and all of those whom his life touched. I join Marylanders from every corner of the state in sending heartfelt condolences to Speaker Busch’s family and friends. He was a wonderful and decent man who will be deeply missed by all those who had the privilege of knowing and working with him over these many years. My heart is heavy today in learning of the passing of Speaker Busch. I was honored to serve alongside Speaker Busch in the House of Delegates, and I came to know him as one of our state's most thoughtful and dedicated legislators who tirelessly worked for his constituents. As the longest-serving House of Delegates Speaker in Maryland’s history, Speaker Bush had an immense impact on our state, working to pass legislation to protect our health and the environment. I join my fellow Marylanders in mourning his passing, and my thoughts and prayers are with his family during this difficult time. It is sad and surreal that Speaker Busch is gone. He was a good man and a dear friend. The coach-like style that he brought to his Speakership lifted all of us up and made us better people and better legislators. He liked to win but what he wanted most was to see everyone 'play the game' fairly, with honor and dignity. My entire family and I wish his loved ones heartfelt condolences and we thank you for sharing him with us for all of these years. He will be sorely missed. I join the entire state of Maryland in mourning the passing of a true statesman. On behalf of the citizens of Baltimore, we extend our heartfelt condolences to the Speaker’s family, close friends and staff. A wonderful son of Baltimore, Speaker Busch never forgot his beloved Charm City. Maryland has lost a dedicated public servant who made a lasting impact on the many lives he touched. As a former delegate and chair of the Harford County Delegation, I will always remember how he treated those of us in the minority party with respect and worked with us for the good of all citizens. As the president of MACo, I know firsthand that he supported our efforts on behalf of all counties in the state. Our hearts go out to the Speaker’s family and friends, and to all those he represented in his beloved Anne Arundel County. Today, Howard County joins those throughout the state in mourning the passing of House Speaker Michael Busch. He dedicated his career in public service to the constituents in his district and residents throughout Maryland. Even with the health challenges he faced during the past few years, he continued his dedication to make our state better. Those closest to him know the tremendous work he accomplished as the longest-serving Speaker of the House to move Maryland forward on the critical issues of our time, including abolishing the death penalty, promoting marriage equality, raising the minimum wage and improving educational opportunities for all children in Maryland. We are deeply grateful for his leadership and service to the entire state of Maryland. His legacy will forever be remembered. Please keep his wife and daughters in your prayers during this challenging time. Our hearts are heavy upon learning of the passing of Speaker Busch. Mr. Busch was a champion for the healthcare industry across Maryland and held an amazing knowledge of facts and figures and of policy decisions across our industry. The Speaker always had the best interest of the people of Maryland at the forefront of decisions that he made. His expertise and friendship will be missed and his passing will leave a large void across the state. Our collective thoughts are with his family at this time. Mr. Busch brought extensive knowledge, wisdom and commitment to the University of Maryland Medical System Board. When he spoke, people listened. The Speaker was a passionate advocate for the unique mission of UMMS as the state’ academically centered health care system and his expertise, insights and assistance were integral to the plans for the System’s recent expansion into Prince George’s County and the Southern Maryland region. The entire University of Maryland Medical Center community sends its deepest condolences to the Busch family. Speaker Busch was a larger than life individual that always strived to put the people of Maryland first. On a more personal note, his commitment to UMMC and the connections that he made with our staff will last a lifetime. The mutual admiration that he and his care team expressed for each other was truly touching particularly in his final days. He was always committed to UMMC's mission and understood our unique challenges. We will continue to live out that mission in his honor caring for the people of Maryland. May his family find peace and comfort knowing that his legacy lives on. Speaker Busch has been a longstanding friend and great supporter of the Medical School. We will miss his sincerity, his wisdom, his kindness, and his tireless commitment to the Healthcare needs of the citizens of Maryland. On behalf of the entire School of Medicine and especially our faculty physicians and surgeons, I'd like to send our sincerest condolences to the family, friends and constituents of Speaker Busch. It was truly a privilege and an honor to know him and to work with him. I am deeply saddened by the loss of Speaker Mike Busch, a great friend and colleague. Mike and I were elected to the House of Delegates on the same day in 1986. I have treasured his friendship ever since, and the people of Maryland have benefited every day for the past 32+ years from his service and his leadership. “Mike was an exemplar of what public service is about. He was honest, selfless, intelligent and giving. He represents the best that democracy has to offer. Our State owes him a debt of gratitude. “I join many others in sending love and thanks to his family. I am saddened to hear about the passing of Speaker Michael Busch,” says President Marietta English. “As a former teacher, his advocacy for education will not be forgotten because he understood the needs of educators in Baltimore City and throughout the state of Maryland. Our hearts and thoughts are with the Busch family during this difficult time. Rest in Peace, Speaker Busch . We are grateful for your years of service to the citizens of Maryland. We offer prayers for your family, friends, and colleagues. We are saddened to learn of the passing of Speaker Mike Busch. While we often didn't agree, he was loved not only by his Democrat colleagues but by Republicans in the General Assembly as well due to his leadership style and caring nature. As the longest-serving House speaker in Maryland history, Mike Busch dedicated his life to serving both the Annapolis community and our state. His impact won't soon be forgotten. Our thoughts and prayers are with his family during this difficult time. After a lengthy illness, Maryland Speaker of the House Michael E. Busch passed away today. Busch was the strongest friend the environment ever had in his role as Speaker. He led the fight for the state's first mandatory standard for clean power in 2004, launching the modern wind and solar power industries in the state. Throughout his tenure he fought for cleaner air, cleaner cars, and a pollution-free future in the face of climate change. We will always remember his legacy, and we will miss him dearly. The Chesapeake Bay lost a champion today. While there were many issues that were near and sear to Speaker Busch, he elevated saving the Bay to a priority for the General Assembly, and legislators followed his lead. He will be sorely missed.